Happy Sunday! It is a bright sunny and chilly morning here -- we got down into the 20s last night....brrrrr! It is up to a "toasty" 36 degrees now at 11:00. This morning I decided to make us a hearty brunch to last the day until dinner time. 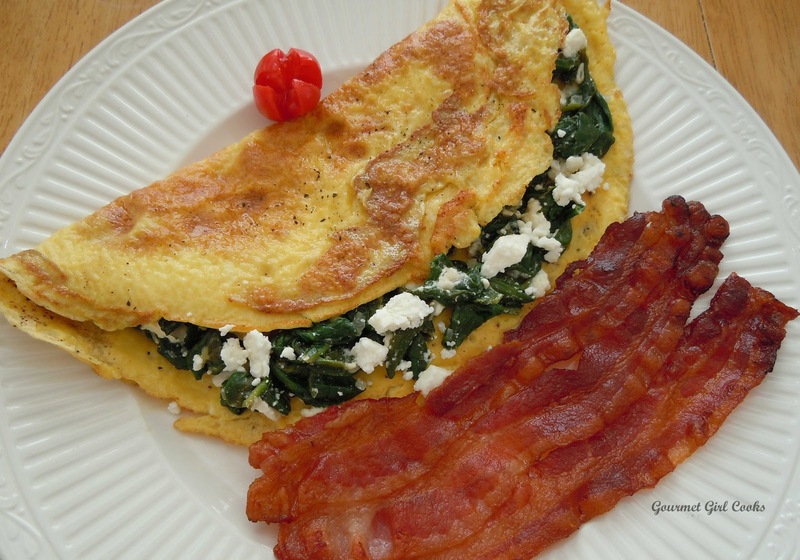 I made "Spanikopita inspired" omelettes along with some oven baked uncured bacon. The omelettes turned out great. I sauteed a minced shallot in some olive oil and then tossed in a few big handfuls of organic baby spinach and wilted it along with the shallots. After the spinach wilted, I added a couple pinches of dried dill, salt, pepper, a few squeezes of fresh lemon juice and then stirred in a few tablespoons of crumbled feta...and "Voila"...I had a healthy Spanikopita-like filling to put in our omelettes. I snapped a pic for you to see below. Enjoy! P.S. -- Happy Birthday Mom -- I love you!!! Your recipe looks very delicious. Now if I could just get my husband to like Spinach. I guess I'll just have to make for myself. Thanks.